A scaly beak could indicate scaly leg and face disease. Parakeets -- and many other bird species -- are plagued by eight-legged microscopic Knemidokoptes mites. In parakeets, the beak, eyelids and cere are primarily affected, although the legs and feet can also show signs of infestation. If your feathered companion develops unsightly scales, a vet visit is crucial. Knemidokoptes mange or "scaly leg and face disease" causes lesions on the skin of infected birds. As these pesky parasites burrow into the bird’s skin, they leave behind collections of white crusts and honeycomb-looking scales. Once infestation begins, it can spread to other areas of the body. Without prompt treatment, the infestation can progress, causing pain for your beloved parakeet and increasing his risk of death. Transmission of the scaly mite typically occurs in the nesting box. As parent birds feed their young, they could also be transmitting mites through direct body contact. 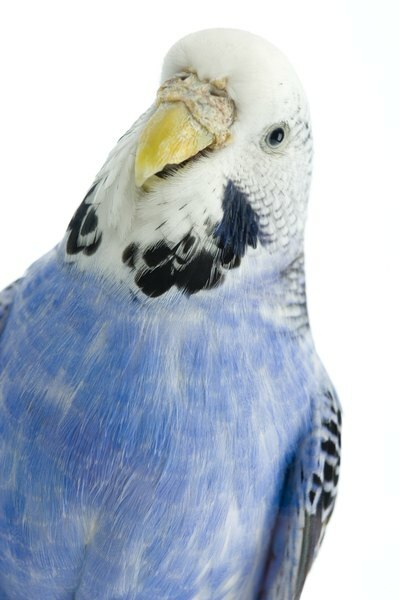 It can be difficult to determine if your parakeet has been affected right away, as up to two years can pass without your parakeet showing any signs of infection. In many cases, parakeets will show symptoms of a mite infestation between 6 and 12 months of age. Infected parakeets may lose feathers and will develop fast-growing lesions on the skin. With a Knemidokoptes infection, only the beak, nostrils, mouth and eyes are affected. It's also common for your parakeet to develop scales or white crusts around his eyes, nostrils and beak. While the scaly mite doesn’t cause itching, your bird’s beak can become deformed over time, possibly causing irritation and pain. Parakeets with Knemidokoptic mange are treated with an antiparasitic drug to eradicate the mites. These medicines can be taken orally or injected into the skin. Even with treatment, beak deformities can still occur. To prevent an infestation, thoroughly clean your pet bird’s cage, food and water bowls, perches and toys with household cleaner. Parakeets should be treated yearly by your vet to help control mite infestations.